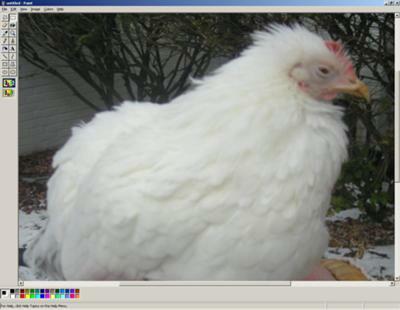 I have a hen (Buff Orpington) who is not feeling well. She has a swollen stomach, it is hard to the touch and seems constipated. Also she had poop stuck on her bottom, I cleaned her up and trimmed a few feathers. What do I do about the stomach aliment? I’m not sure what you are describing as her “stomach”. A chicken’s craw or crop is located near the base of the neck and on the upper right of the breast area. The crop is the first stage of digestion in a chicken, where liquids help break down solid foods and begin the journey through the rest of the digestive system. If this is the part that seems swollen, it’s possible she has an impacted and sour crop. A crop packed with grains or chicken feed and not enough water can become solid and indigestible. As this food mass sits there, without enough water to break it down, it can sour, building dangerous levels of bacteria. If left too long the bacteria can actually begin to break down the lining of the crop. Some helpful treatments for this would be to withhold food and encourage liquids until this mass clears. Plain warm water or mixed with raw apple cider vinegar can help; about 1 tbsp per ½ cup of water. It is probably necessary to massage this crop lump gently to help it break down with fluids and help it pass through; possibly holding her upside down gently removing most through her mouth. If this sounds like the problem you can find much more information by searching “sour crop chicken” on line. It’s hard to say what has caused what sounds like diarrhea. I wouldn’t be too concerned about that until you get her system unblocked and eating and drinking normally again. Giving live culture yogurt or a probiotic supplement will help reestablish good digestive bacteria, which may solve the diarrhea problem. If not she may have some other intestinal issue. I hope this gives you something to go on to help her. We have six egg laying organically fed hens. Five days ago we noticed that at least four have lumps on right breasts only. They are about 2.5 inches by about 1.5 inches with the skin raised up by about a half an inch. They are still behaving normally and giving us about 3 to 4 eggs a day. Is this anything to worry about? Will the lumps go down by themselves. These 4 girls may just be enthusiastic eaters, packing their crops with good organic feed. That would be my first guess, especially with 4 out of 6 looking this way. You can just continue to observe and make sure all is OK, or you can catch them and feel the lumps. If it is just a nicely packed crop it will feel a little lumpy and soft. Just make sure they have access to clean water, and live foods like whole seeds, greens or fruit. Some organic feeds are processed and don’t provide any digestive enzymes like a chicken’s natural free-range diet would. If you are confident that your girls have a good balanced diet, there should be nothing to worry about. If these lumps are something more, I would recommend taking one of them to the vet for an exam. My chicken has a swollen breast. It’s come up in the last couple of days, also some of the feathers are missing. She seems very happy and not in any discomfort. She is still laying eggs. Should I be concerned? Often a well packed crop is mistaken for something out of the ordinary. With the skin stretched it can look like the feathers are thinner or missing. This may be all you are seeing. The crop is a pouch at the top right of a chicken’s breast at the base of the neck. Some hens are better eaters than others, possibly more dominant in the flock and this one can eat as much as she wants whenever she wants. Make sure none in you flock are too thin, possibly add another feeding station so all have access to as much food as they need. I’d suggest a very close inspection of this hen. Feel the lump you see. If it’s the crop is should feel a bit mushy and lumpy, depending on what you feed. This is the first step in chicken digestion, where grains and feed are soaked with water and gradually move further down the digestive tract. Always make sure you chickens have access to plenty of nice clean water, and a packed crop should never be a problem. Baby Chick with Lump in Neck: My baby chicken has a lump in its throat? What do I do? Or what is it? 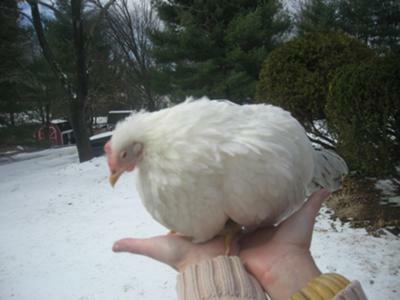 The lump in this chick’s neck is probably just from the contents of its crop or craw. The lump is generally nothing to worry about, unless it feels solid rather than mushy. If a chicken doesn’t or can’t drink enough water along with its feed, the crop contents may become too thick to digest properly. The solution is to withdraw feed temporarily and encourage fluid intake. (One tablespoon apple cider vinegar for ½ cup water, will aid digestion). After it has had a bit of fluid, gently massage the crop contents, then offer more with an eye dropper, or by dipping its beak in a shallow dish or spoon, allowing it to swallow on its own. Often this is all that is needed. If this condition is allowed to go on too long, the crop contents can begin to spoil, growing too much bacteria, which can be poisonous to the chick. If you notice a rotting smell from the mouth of the chick, you should try to gently remove the crop contents; offering lots of fluid, massaging the crop contents until soft, holding the chick upside down by the legs, and gently milking crop contents out through the mouth. Any noticeable feed still in the crop should be allowed to empty before the chick eats again. Continuing to offer fluids and allowing the chick to swallow on its own for about an hour should clean out the crop enough to let it eat. I would suggest offering some soaked feed for a few days until the chick has a chance to recover and hopefully do well on its own. 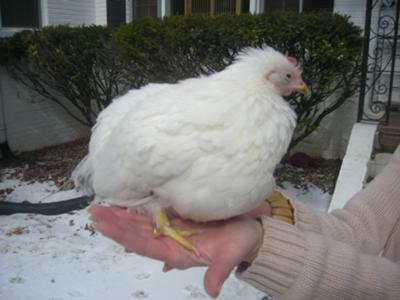 Japanese bantam hen sick: My solo 6 year old Japanese bantam hen has lost the color in her face and her legs seem very weak she doesn't perch anymore. Also she cant hop up the steps, and has fallen over a few times and doesn't have much output. 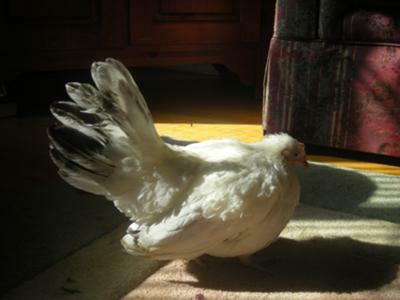 She went through a molt but when her feathers grew back the looked ruffeled. She sleeps a lot at the corner of her cage, her crop is bulged all the time, and there seems to be an additional lump of something at the upper part of her throat - maybe a 1/2 inch below her waddle which she tries to process by stretching/rotating her head and neck around. She hasn't been outside in a while because of the snow, and I started to give her small stones in her cage in addition to forcing her to go outside. Her left wing seems to droop more than the other, and she is losing weight. Just so you know, she sleeps indoors in a cage at night, and we usually put her outside for the day - hasn't wanted to go out. It sounds like she may have a sour or congested crop. I would suggest offering her warm water, about ½ cup with 1tbsp apple cider vinegar. I would offer as much as possible to her with a spoon up to her beak and give her time to drink and swallow. The lumps you are noticing at her neck and crop area are probably food that has become too dry to pass from her crop to the rest of her digestive system. The vinegar will help to break it down so it can be digested and you should massage the lumps, when she has taken a bit of water, to help break the mass up so it will pass. I would keep her warm and continue to offer her liquids until the lump has passed, if you believe this is the problem. It’s really hard to tell for sure without seeing her or feeling the lumps.